The Pakistani’s call it PAC JF-17 Thunder (joint fighter-17) whereas the Chinese call it CAC FC-1 Xiaolong — fighter China-1 fierce dragon. It is a lightweight, single-engine, multi-role combat aircraft that can be used for reconnaissance, ground attack and interception. Pakistan is all set to paint its Air Force red- literally so. The way things are moving, the day is not far when Pakistan Air Force (PAF) would look like a clone of the Chinese Air Force. That will be the day when exclusively Chinese fighters will answer all PAF call signs. At this rate, the two would look the same like identical twins within a few years. Pakistan is planning on induct 250-300 JF-17 Thunder Block II in its air force next year. These jets have been co-produced by Pakistan Aeronautical Complex (PAC) and Chengdu Aircraft Corporation (CAC). For nearly a decade, now Pakistan Air Force has been flying Chinese Shenyang F-6, Q-5s, and F-7s. Pakistan is now negotiating deals for FC-31 fourth-generation stealth fighter aircraft, wide-bodied Y-20 heavy military aircraft and Z-10 attack helicopter from China. These aircraft along with the existing Chinese made Chengdu F-7 Skybolt, and Ilyushin Il-78 already in use will form the mainstay of its operational requirements. The American F-16 Fighting Falcon and French Dassault Mirage III are the only alien, non-Chinese aircraft in its inventory. The Pakistan Air Force (PAF) currently has some 22 combat squadrons including about 3,000 pilots and 608 aircrafts. Pakistan traditionally used to buy US war planes and avionics in the 80s and 90s till the Americans imposed sanctions and delayed the delivery of a second batch of 28 F-16 Fighting Falcons. From Pakistan’s perspective, the US has let Pakistan down on various occasions in the past and hence it is not a reliable and trusted weapon supplier. As far back as 1965, Pakistan was left high and dry when US endorsed an embargo on arms sales when Pakistan under the leadership of Field Marshall Ayub Khan, launched Operation Gibraltar against India. Even at present Pakistan’s worst fear is that any changes in the stringent US arms export rules can upset the upgrade, OEM supplies and servicing of F-16s Block 52s the top-notch combat aircraft in Pakistani Air Force. Even after paying millions of dollars, Pakistan is virtually at the mercy of the Americans who can pull the plug anytime and render the entire fleet useless. Many of the aircraft component and superior avionics are imported from USA and hence susceptible to unfavorable changes in the US export control policies. What this means is simply that America can easily arm twist Pakistan if and when it wants. According to sources, USA has installed secret tracking devices on the F-16s supplied to Pakistan to present possible misuse as well as keep a tab on the aircraft’s movements. The US can effectively stop all after sale support and bring the whole fleet to a grounding halt in case of any unauthorized use or violation of the contract. It was what was making Pakistan uncomfortable. It was on a lookout for an alternative and reliable source for its advanced military hardware and weapons. The fledgling Chinese military aviation industry grabbed it as a God-sent opportunity. It was a win-win situation that suited both. 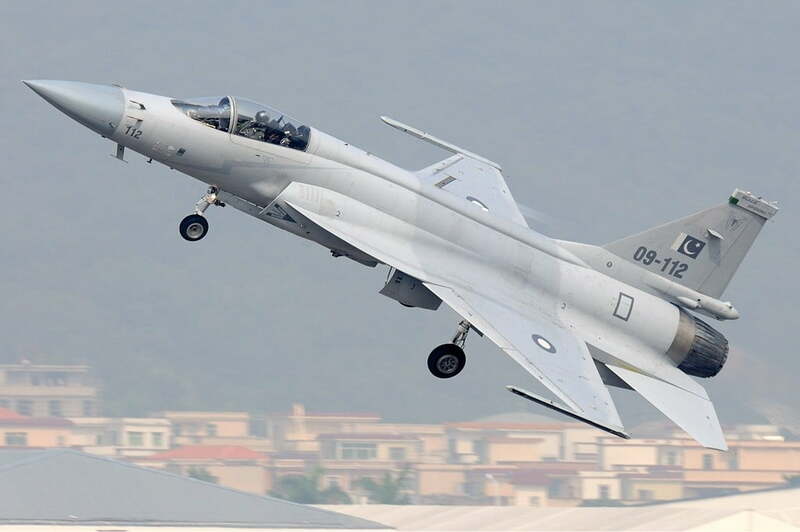 The outcome was a co-production to roll out the JF-17 Thunder – with Pakistan contributing 58 percent of the airframe and China 42 percent respectively. China has replaced USA to emerge as one of the world’s largest arms exporter largely due to supplies to Pakistan. Pakistan accounts for 55% of Chinese arms exports and likely to remain the largest recipient of Chinese combat aircraft, submarines, and frigates, according to SIPRI report. The Chinese FC-1/JF-17 aircraft with a top speed of Mach 1.6 and a radius-of-operation of 648 n miles (1,200 km) it is going to be the fulcrum of PAF’s combat capability. Pakistan recently acquired F-16C/D Block 50/52 aircraft equipped with advanced weapons, radars, and electronic warfare (EW) systems. Both F-16 Falcon and JF-17 together could form the backbone of the Pakistan Air Force (PAF). 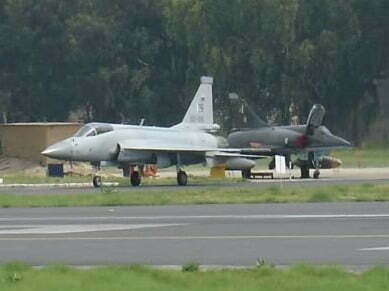 The initial lot of JF-17s first entered PAF in 2010. . The Pakistan Aeronautical Complex (PAC) where the aircraft is manufactured west of Islamabad, can produce 25 aircraft per year. The JF-17 Thunder is a highly versatile battle platform for air to ground, air to air and air to sea operations. The aircraft capable of in-flight refueling and advanced defensive countermeasures can carry 8,000 pounds of fuel, equipment or munitions. Some of its state of the art features include a fly-by-wire control system, full-color digital display, and pulse-Doppler radar, laser designator for ground attack. It is equipped with Chinese PL-5 and PL-9 short-range infrared and missiles PL-12 radar homing missile for beyond-visual-range target engagement. In the air-to-ground mode, it can drop precision-guided missiles, laser-guided bombs, anti-runway bombs, 1,000 kg bomb, 500 kg bomb, rockets, and anti-ship missiles. According to sources, Pakistan is keen to procure about 40 Chinese Shenyang FC-31 to augment its air combat capabilities and favorable tilt the strategic balance over the Indian Air Force. China claims that its FC-31 developed for the export market is comparable to US F-35 Joint Strike Fighter. Pakistan, which has a relatively smaller air force, always wanted advanced aircrafts to masquerade as a superior air force. Both JF-17 and JF-31 are fitted with the same Russian Klimov RD93 engines. The JF-31 would allow Pakistan to retire some of its aging aircraft, and tactically deploy only JF-17 and JF-31 for all kinds of combat roles. China too has a vested interest in the deal. It will get its first export customer if the JF-31 deal comes through. Besides the money earned could help offset its development costs.